In some respects March 23, 2018 was a celebration of a musical style perfected by the Eagles. Yet, as the evening unfolded it was also a salute to Nashville - a city that is still very much associated with county music. Of course, this genre deeply influenced the Eagles who formed in California back in the early 1970's. The Eagles were among a group of pioneers who melded country with rock. They ended up becoming one of the best-selling bands ever. The Eagles were in Nashville, Tennessee March 23 and 24 for a two night engagement at the Bridgestone Arena located in the heart of Music City's downtown. The energy was high both inside and outside the venue on Friday prior to the Eagles taking the stage a little after eight. 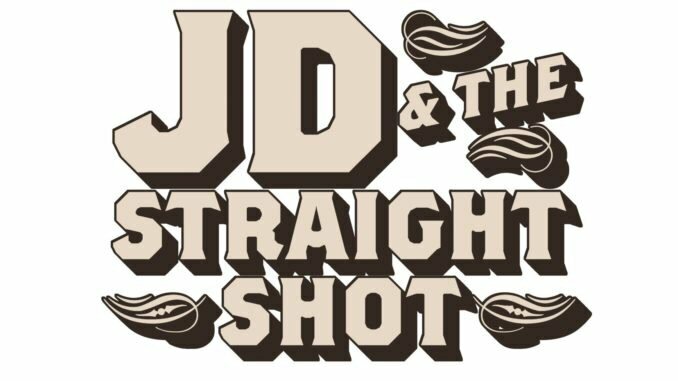 Before the main event at the Bridgestone, JD & The Straight Shot kicked things off. The group has a number of opening slots on the Eagles' current tour. JD is fronted by Jim Dolan an executive and musician based out of New York. Yet, the man from the Big Apple can be found in Nashville recording and then touring with some of the town's top talent. JD is promoting his latest release Good Luck And Good Night a flavorful platter of bluegrass, country, rock and roots. Highlights of the album and JD's set included the reflective and rousing "Redemption Train" and the melodic "Moonlight" shining brightly with banjo and fiddle enhancements. JD thanked folks for coming early. He mentioned that one of their songs had been used in a movie but not one that too many saw - too bad as "Perdition" was packed with potent prose as "Better Find A Church" inspired. "Run For Me" channeled the patterns of horseracing in an Irish folk-meets-country progression. "Ballad Of Jacob Marley" re-told the tale of A Christmas Story about greed and the ability to change. JD & The Straight Shot closed with a classic from Three Dog Night. Influenced by artists such as The Beach Boys, Pink Floyd and The Beatles along with traditional Irish folk and classical music Good Luck And Good Night delivers a sound steeped in the quiet fire of American roots music with the swagger of rock as demonstrated during JD's starting slot. With the Eagles from the west and JD from the east, Vince Gill is somewhere in the middle. Vince has strong connections to Nashville which includes his annual Christmas concerts at the Ryman with his wife Amy Grant. Gill has achieved commercial success from his role as front man in the country rock band Pure Prairie League in the 1970s and as a solo artist beginning in 1983. Vince has charted over 40 singles on the U.S. Billboard charts as Hot Country Songs, and has sold more than 26 million albums. He has been honored by the Country Music Association with 18 CMA Awards, including two Entertainer of the Year awards and five Male Vocalist Awards. Now, one of country's finest is flying high as one of two new members of the Eagles. The Eagles soared in Nashville. "It was a no-brainer for us to get Vince. Nobody else, other than Deacon (Frey), we even discussed," Don Henley told Rolling Stone. "He fit like a glove. And his personality is great. He's just glad to be there. He's probably the happiest guy onstage." Henley noted that Gill, "has struck a nice balance between honoring what Glenn did, then putting his own little spin on it. In the beginning he was trying to sing the songs exactly as Glenn sang them, in phrasing and emphasis. But over the past few shows, he's put his own twist and interpretation on the songs. It makes it more authentic to him." Henley said it would have been impossible for the Eagles to keep going after the death of Glenn Frey if they hadn't recruited "family blood" in the form of Frey's son Deacon. When Deacon performed "Peaceful Easy Feeling" at his father's memorial service, Henley recalled being impressed with what he heard. "As difficult as that might have been, he was so brave and composed," the singer and drummer said. "I'm sure, on the inside, he was churning. After a few months went by I thought, 'Why not see if he would like to be in the band?" Back in Nashville, "Seven Bridges Road" was the strong opener to showcase the Eagles' signature multi-part harmonies. Longtime member Joe Walsh introduced newcomer Deacon Frey as he took the lead on "Take It Easy" followed by "One of These Nights." Don introduced Vince Gill who was proudly sporting a Nashville Predators jersey. Gill stepped up for "Take It To The Limit" with strings. A few songs later "Witchy Woman" was soaring with the horn section contributing additional sparks. Joe took the helm for "In The City" as cityscapes towered above the musicians. Fan were on their feet as the epic two and a half hour concert came in for a landing. Although so many of the Eagles' songs could stand on their own merit the use of lighting paired with multiple big screens with scrolling visuals and various band shots added to the group's polished presentation. The horns and strings also raised the bar as the Eagles glided through hits such as "Lyin' Eyes," "Already Gone," "Heartache Tonight," "Hotel California" and more. Timothy B Schmit invited folks to sing along - "if you can" before he tackled the high notes of "I Can't Tell You Why" and later on "Love Will Keep Us Alive." Vince Gill presented "Next Big Thing" from one of his own albums. Interestingly, solo work from Don Henley was not included but quite a few numbers from Joe Walsh were well-received by his fervent fans. "Life's Been Good", "Funk 49" with horns and "Rocky Mountain Way" which was part of the encore proved Joe is a vital member of this high flying outfit. The Eagles closed on a softer note with strings underlying the storytelling of "Desperado." West and east met in Nashville for a night of classic, country rock with the Eagles, JD & The Straight Shot and Vince Gill - all taking it to the limit at the Bridgestone Arena in the heart of Music City. 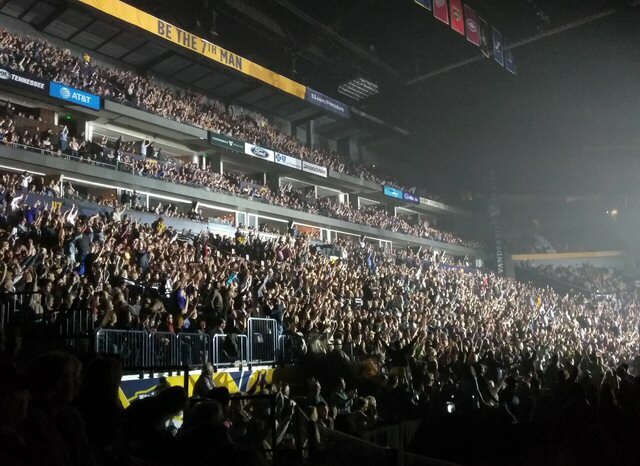 The venue is home ice for the Predators and it also hosts a wide array of concerts. Upcoming events at the Bridgestone include Demi Lovato, Chris Tomlin, Brad Paisley and Lorde. In many ways the Eagles are a brand new band in 2018 just finding their wings.